35 Abou El Feda St. The recent nationwide power outages have left many of Cairo’s restaurants scrambling to keep their kitchens operating at an appropriate standard. Amidst claims of subpar quality, sushi restaurants across the city have suffered heavy blows to their usually impeccable reputation. Located in Om Kalthoum street in Zamalek, Fuego has recently reopened their doors after allegations of food-poisoning. Walking in rather early on a weekday, the small seating area was empty enough to grab the table in our favourite corner. The interior of the restaurant is decorated in warm, autumnal colours with dim lighting and rich wooden fixtures. The usual placement of the preparation table on the dining floor was sacrificed in favour of seating space and is positioned in the far end of the restaurant. Leaving us to mull over the menu for a few minutes the waiter returned and patiently stood through the meticulous orders we placed. Ordering the All-You-Can-Eat offer (180LE per person), we pulled out all the stops and requested everything from classic nigiri and hoso maki, to the more elaborate temaki hand rolls, dynamite rolls, green dragon rolls, spicy rolls and crispy rolls. In addition, we also ordered sides of spicy mayo, sriracha and teriyaki sauce. Our orders were presented on separate platters and were placed in front of us. While we were sceptical at first in regards to the publicised claims against Fuego, our reservations were immediately subdued after the first bite. Thankfully, the power cut just as soon as we received our plates and the back-up generator kicked in almost immediately after, providing an ironically romantic atmosphere to the sounds of our ravenous chewing. The octopus, salmon, shrimp, and eel nigiri were fresh and silky in texture, complementing the fluffy sushi rice to create a perfectly well-rounded bite. The more intricate rolls were drizzled with house-made sauces and provided a more contemporary sushi experience. Filled with tender eel strips and fried shrimp tempura, the green dragon roll was wrapped with lettuce soaked with caramelized teriyaki sauce. Presented with red crispy rice, the spicy roll was packed with a dangerous amount of heat that had the table reaching for water. Though the only downside to Fuego are the cramped quarters and heavy dinner traffic, the intimate atmosphere and good dishes makes this restaurant the city’s sanctuary for consistent sushi quality and attentive service. 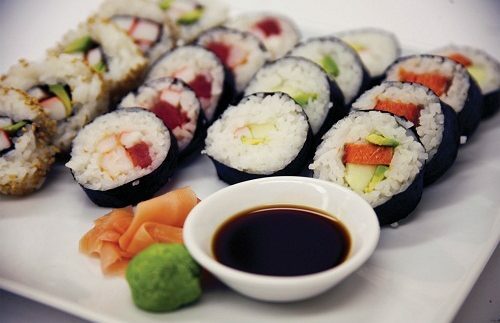 Fuego has another branch in Maadi that serves mains and steaks in addition to sushi. Easy, maliable staff who will do everything in their power to make sure you're meal is to your suiting. Fuego has a strict 'no smoking' policy - wait, that's a good thing, right?